Samsung†s new MW3100H Solo/Grill offers a sleek, premium design to seamlessly fit any modern kitchen décor. The transparent black of the Crystal Gloss™ handle and dial creates an elegant exterior. An ice blue display brightly illuminates the settings and clock, making them easy to read and operate. Serve perfectly cooked fresh vegetables, pasta and more with ease in the MW3100H Solo/Grill Oven. 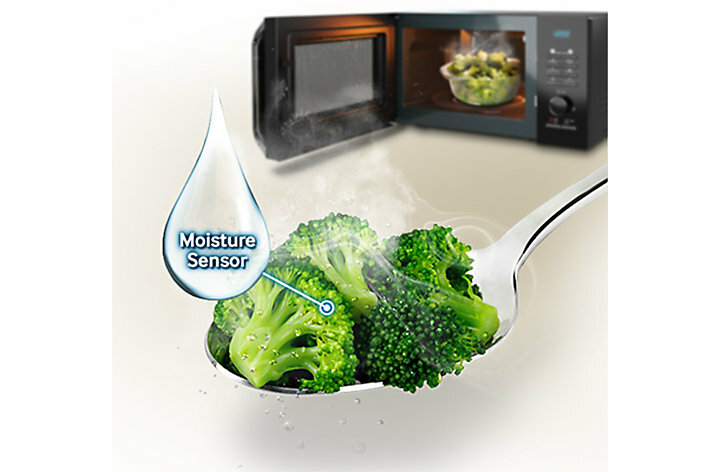 With the simple push of a button, Samsung’s unique Smart Moisture Sensor determines the interior air humidity to determine whether cooking stages are completed, eliminating over- or under-cooked meals. 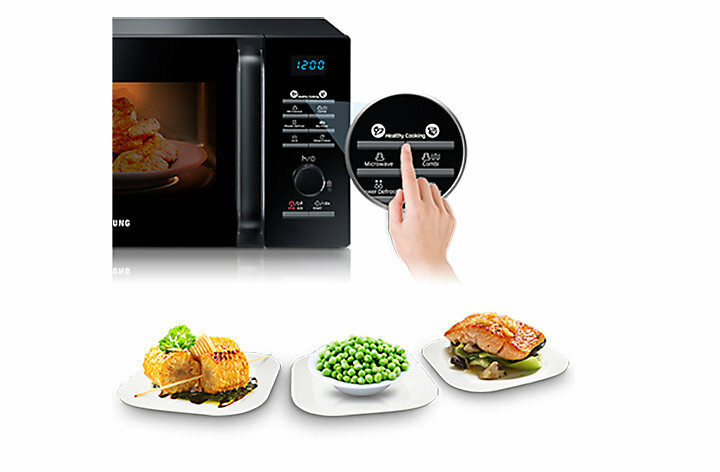 A variety of fresh and healthy meals are at your fingertips with 20 pre-set cook modes on Samsung†s MW3100H Solo/Grill. Easily cook everything - from green beans to brown rice, boneless chicken breast to fresh salmon fillets - confident that the result will be moist and flavorful food. Enlist the MW3100H Solo as your sous chef. Four modes - Melting Butter, Melting Dark Chocolate, Melting Sugar and Soften Butter - achieve perfectly soft or melted ingredients for your culinary creations. Whether a novice cook or seasoned chef, this helps elevate any kitchen to a professional level. Satisfy cravings for traditional tastes of home, with a wide variety of pre-programmed local recipes on the Samsung MW3100H Solo/Grill. Now, prepared dishes are just a simple setting away, helping reduce overall meal preparation for more time enjoyed around the table. No more scrubbing or scratched surfaces. 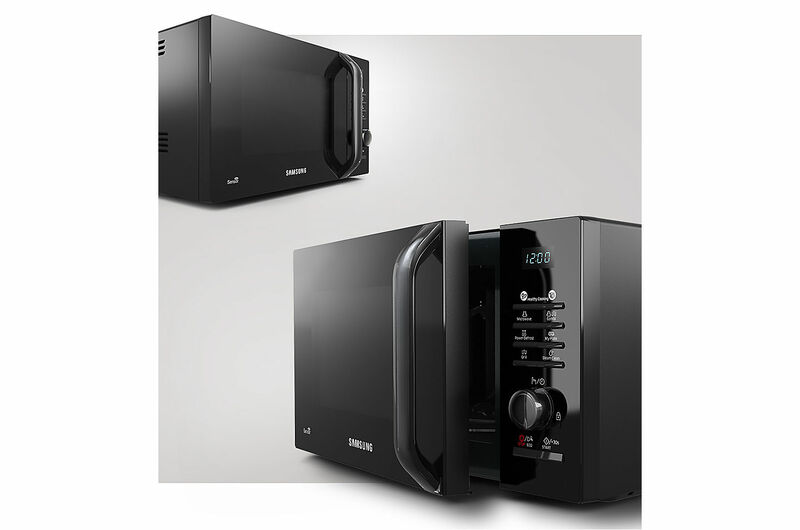 With a ceramic interior, the Samsung MW3100H Solo/Grill Microwave Oven offers a smooth surface that is easy to clean and won†t discolor over time from oil or grease residue. Compared to stainless steel and epoxy interiors, this ceramic interior cavity is anti-bacterial and scratch-resistant, providing long-term superior quality. Even at rest, similar microwave ovens use power to maintain essential functions. Selecting the ECO Mode setting on the new Samsung MW3100H Solo/Grill significantly reduces power usage, delivering savings to your household on monthly energy bills.